Dallas-based Flea Style held its inaugural Houston Market at Silver Street Studios. I first heard about the market through one of their vendors, and one of my vintage gals, Caitlyn of Alex & Afton Vintedge in Tyler, TX. During one recent sunny Saturday, Flea Style opened its doors to hoards of shoppers that browsed over 100 booths- ranging from vintage wares, clothing, jewelry, home decor, and more. Alex & Afton Vintedge– Vintage slinger Caitlin Brax, along with her sister, brought their eclectic mix of vintage goodies to the market. It was so great to see her and finally meet her mother, Lori. Lori -a talented sewer- creates amazing caftans, jumpsuits, etc from vintage patterns and creates them by using vintage fabrics for her brand- Mod Melrose. I left the booth with a couple pairs of boyfriend jeans, which I’m so happy to have found and that they fit. Julie McCullough owns Dallas-based Folksie, a brand that believes in small-batch production and is made in the USA. I was loving the linen and hand-dyed jumpsuits, dresses, and kimonos. North Texas-based ceramics company- Lemonglaze is owned by Carmen Aberasturi. She does a wide range of giftable and collectible pieces, including: ring dishes, plant markers, plant pots, and larger serving dishes. I personally loved the cactus print (everything) and the ‘little bird’ dishes. Oregon-based Ladies of Paradise was founded by Jade Daniels and features a unique variety of vintage and modern jewelry and accessories from countries such as: India, Turkey, Thailand, Afghanistan, Spain, and Guatemala. I literally stopped in my tracks upon seeing a succulent in a vintage ARIZONA cup and saucer at the Hearth and Hovel booth (and I obvs bought it, too). The Dallas-based brand was founded by husband and wife team: Chaz Anderson and Mia Pettyjohn, and also features local artisans and their closest friends. I adored all the succulents in the cutest cup and saucers, as well as other vessels. Also in the booth were watercolor prints, hand drawn silkscreen pillows and handwoven blankets. Another one of my vintage dealer gals, Arrica, had her shop- Collected Vintage Closet there. I got the coolest gold beaded vest and palm print top there! Catherine Miles launched Found Images during her senior show at Midwestern State University in Wichita Falls, TX some years ago. Along with selling some vintage pieces, she also sells the coolest lamp shades (I can’t stop thinking about the cactus lamp shade), and other apparel, home furnishings and gifts that have nostalgic retro images on them or are in some way affiliated with travel memorabilia. While browsing the main aisle, a lovely floral scent drifted into my nostrils. I followed the scent to the Milk and Bubbles booth. The Dallas-based handmade soap and bath company was founded in 2013 by Stephanie Serhal. Everything is crafted by using natural ingredients, such as: goat’s milk, flower petals, and oils. I’m a HUGE fan of wall hangings, so it’s no wonder that I had to stop at the Wool and Weave booth. The cute Dallas-based shop is on Etsy, but also does the Flea Style market. The owner- Marie Matter, creates the cutest woven tapestries that are in a variety of sizes and colors from naturally-dyed yarns. Julie Windsor’s shop- East to Oak, offers darling custom artwork, design and paper goods. I of course, loved the cactus prints. Texas sisters- Laura & Amanda Ernst opened Sunshine Tienda Shop on the basis of their journeys in fashion, being constantly inspired by NYC’s cultural diversity, and traveling the world. They offer goods (seemingly from the Mexican and Central American countries, and India) that range from Huipils, caftans, a blend of home goods, jewelry, accessories, and more. I was drawn to the vibrant colors and unique items that I know would help create a captivating home environment. The Vintage Arah was another great vintage clothing stop in the market. I really loved Arah’s cool curated vintage selection of clothing, jewelry, accessories, shoes. I wound up getting a Southwest-style coyote brooch to add to my collection. Rainy Day Illustrations was founded in 2014 by mother- daughter team Annie Peck and Suzanne Simmons. They specialize in watercolor prints and photography wood transfers. The watercolor prints are done by Suzanne, while the photography is done by Annie. I was drawn into the booth by Suzanne’s beautiful watercolor of a cactus. 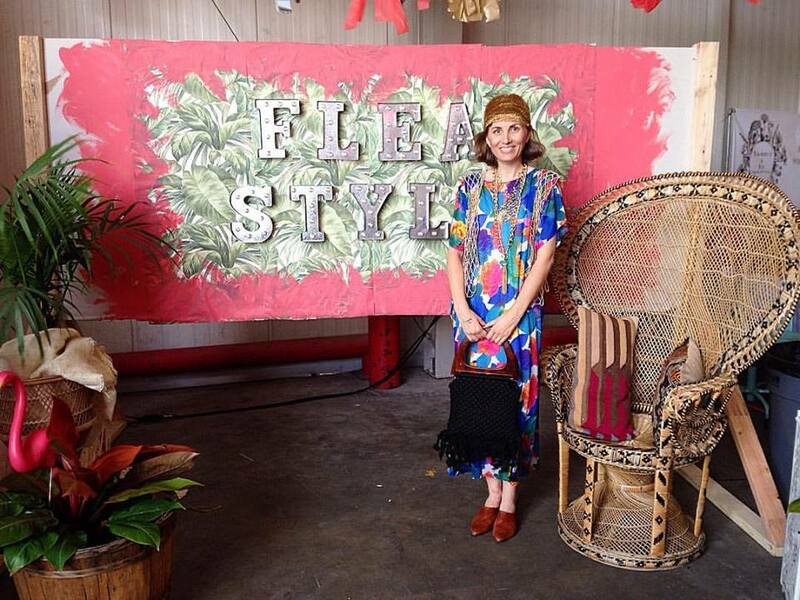 I had an amazing time at Flea Style and am excited to see how it continues to grow! So cool that you can go to one place and get a whole bunch of different items! It’s great that little shops can get their stuff out there without having to mass produce! Thanks for sharing! I love going to Flea Markets! I haven’t been in so long though! You can find the best stuff there!! This sounds like such a fun event. Rainy Day Illustrations has some beautiful work. Thanks for sharing! I’m so sad I missed this! Your outfit is on point as always and I’m going to have to check out all the shops listed here! Thanks Heather! Nice! So many eclectic vendors. Looking forward to this market growing. Omgsh I bet this was heaven for you! Thrifting/flea markets sound like so much fun, but I never know what I would want to buy!?!?! I’m so sad that I didn’t know about this!!! I love Flea markets. My aunt used to run a flea market in Pennsylvania! They are dear to my heart because of her! So all abut events like these. Loving that they’re starting to expand in and around Houston! This sounds AMAZING!! I sure hope they come to Houston again! I would love to go!